The Rosen Shingle Creek is an architectural achievement when it comes to creating a fusion between natural and artificial. 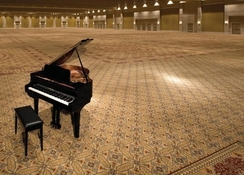 The hotel is situated on Universal Boulevard close to the Orange County Convention Center. This convenient location makes the hotel minutes away from Orlando’s popular theme parks. The accommodation options come in the form of elegantly designed rooms and suites with luxurious first-class facilities to help you enjoy a comfortable holiday. 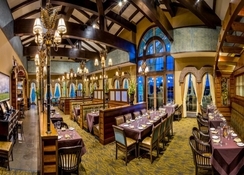 At Rosen Shingle Creek, guests can enjoy a wide range of scrumptious dishes and excellent drinks. The hotel also boasts the award-winning Shingle Creek Golf Club where guests can tee off, as well as the on-site Brad Brewer Golf Academy that helps them learn the tricks of the game. Relaxation and recreational amenities at the hotel include four heated swimming pools, hot tubs, poolside amenities, luxury spa, basketball and tennis courts and video games room. 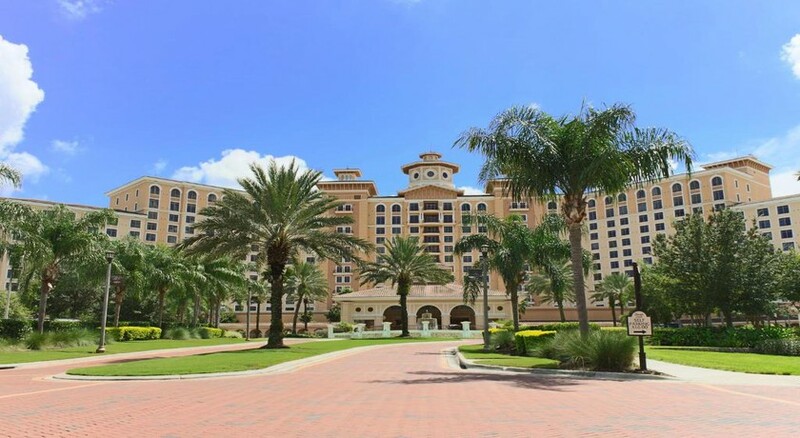 Outside the hotel, guests can explore the world-famous theme parks and the nearby shopping malls such as The Mall at Millenia, The Florida Mall, Orlando Premium Outlets and Pointe Orlando. 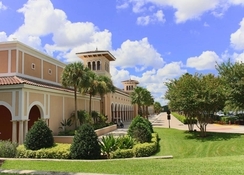 The Rosen Shingle Creek is located in the east of the Orange County Convention Centre. Theme parks like SeaWorld Orlando, Universal Orlando Resort, Aquatica and others are at a walking distance from the property. The nearest airport to the Rosen Shingle Creek is Orlando International Airport at a distance of 13 km (10 minutes’ drive). The hotel is also in proximity to a number of shopping malls, such as the famous Florida Mall, which is just 5.2 km away. Accommodation options at Rosen Shingle Creek offer luxury and comfort amid natural settings. Every room at the hotel presents such magnificent views that you would not want to step out of your rooms. There are more than 1,500 rooms and suites that blend natural tones with Spanish-revival design. 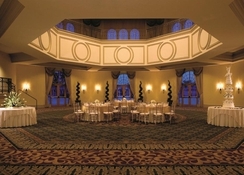 They boast custom carpet designs that captures the fauna of Shingle Creek in caramel and bronze hues. Each of these rooms is well-equipped with complimentary Wi-Fi, hardwired internet, 40-inch flat screen TV, mini refrigerator, in-room safe, voicemail telephone, plush robes, coffeemaker, I-Home docking station and radio, hair dryer and Caswell-Massey guest room amenities. The plush Creek Sleeper beds are made comfier with designer linens from New York-based textile designer Stacy Garcia. 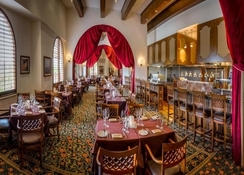 Rosen Shingle Creek serves an incredible range of dining options at its on-site restaurants. There are two fine dining restaurants – A Land Remembered steakhouse and Cala Bella Italian restaurant that satiate the taste buds of guests with first-rate food. Guests can take their pick from Banrai Sushi (sushi), Shingle Creek Clubhouse Grille, Café Osceola & Osceola Bar (buffet and a la carte food options) and 18 Monroe Street Market (24-hour deli). The bars guarantee you evenings full of recreation and refreshing drinks whereas you can try out some of the most exquisite drinks at the Rosen Shingle Creek. These include Mi Casa Tequila Taqueria, Tobias Burgers & Brews, Cat-Tails Pool Bar & Grille and Headwaters Lounge. For non-alcoholic beverages, head to Smoooth Java or Creek Ice Creamery. Bella’s Bar is a cosy piano bar located in the vestibule of Cala Bella restaurant serving great cocktails. Rosen Shingle Creek is a golfer’s paradise. You get to enjoy a luxurious golfing experience at the Shingle Creek Golf club. This golf club is a David Harman Design that has created a challenging golf turf for master golfers. The hotel also has an on-site Brad Brewer Golf Academy to help you train for the game. At Rosen Shingle Creek, you can also relax and rejuvenate yourself at a state-of-art Spa. The spa also boasts of a luxurious salon where you can engage in a wide range of beauty treatments. The hotel also features 4 outdoor heated pools including a kids’ pool, 2 hot tubs and poolside amenities. 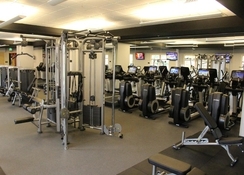 Sports lovers can get active at the on-site basketball, tennis and sand volleyball courts. The hotel is located near Orlando’s renowned theme parks as well as buzzing shopping malls, so there are aplenty entertainment options outside the hotel premises. Pets are allowed, but charges may apply.